Apple Watch has a variety of fitness tracking and motivational features that are aimed at improving the wearers activity and health, or at least their awareness of it. One of the most notable features for Apple Watch users is the “Stand Reminder”, which, much as it sounds, is a gentle reminder to stand up every 50 minutes and move around for a bit. The Stand Reminder feature is aimed at combating the incredibly detrimental health consequences of sitting too much, something that nearly all of us with desk jobs do, and the gentle tap and chime can be quite effective to move around a bit. 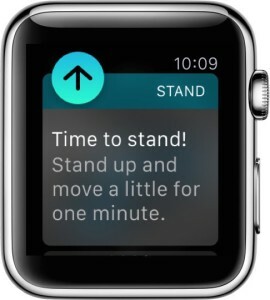 While the “Time to Stand!” reminder can be an undeniably beneficial nudge in a healthier direction, not all users want the Apple Watch to tell them to stand up and move around for a minute every hour. Additionally, there are times where it’s not practical, if not impossible, to stand every hour, and thus some users may wish to disable the feature, or re-enable the feature again at a later time, even if on a temporary basis. With the setting off, the Apple Watch will stop nudging you to stand up every hour and ‘move a little for a minute’, but, and this is important to note, it will still track your standing activity. 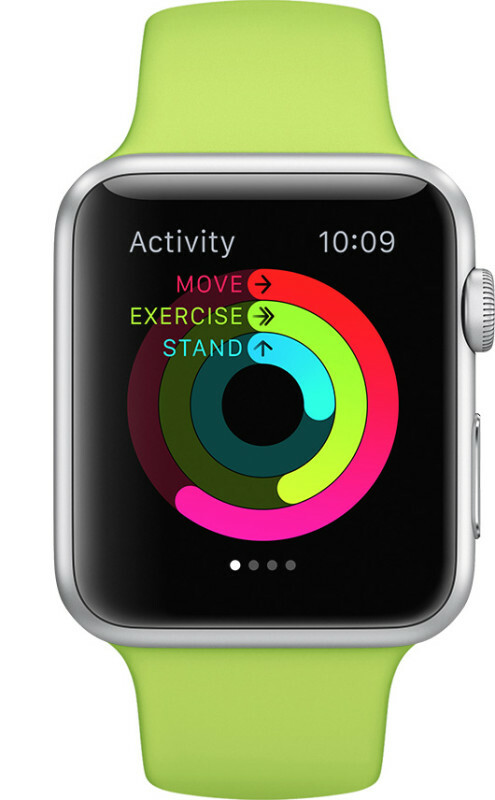 Thus, whether you have the reminder turned off or on, your stand count in the Activity Ring and elsewhere in the activity monitoring features of Apple Watch will continue to function and monitor your standing and sedentary behavior. For most Apple Watch users who are able to regularly stand for a minute and have office jobs, spend a lot of time at a desk, or even the couch in front of a TV, they should probably leave the stand reminder turned on. The reality is that sitting is absolutely dreadful for our health, and studies have linked too much sitting to premature death, heart disease, diabetes, and general metabolic function, and there are no shortage of comprehensive studies to demonstrate this. So even though it’s a matter of user preference, if you’re able to, you should leave the stand reminder on, and work to fill the stand activity ring. The reminder is just one of the subtle but perhaps potentially very powerful health benefits of Apple Watch, whether you’re a fitness nut or an average nut. Can I change the Stand Up reminder time? Why every hour? Why for a minute? 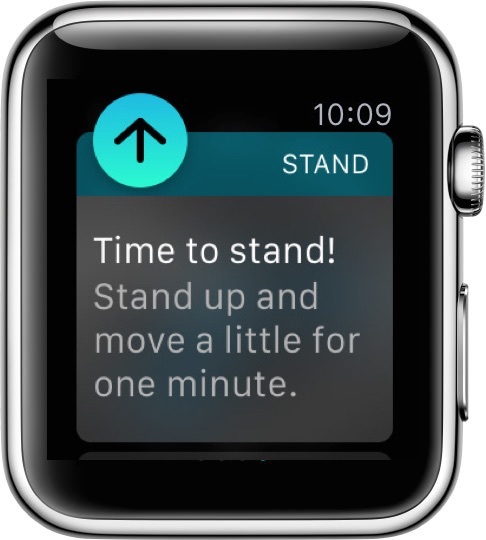 Currently, you can’t change the stand up reminder time, which is set to nudge you ever seated hour and tell you to move around for a minute. If that sounds arbitrary, and if you were wondering why Apple picked the Watch stand reminder to nudge you every hour and tell you to move around for about a minute, it could possibly be due to studies like this, which demonstrated that light activity every hour can help to ward off the most harmful effects of constant sitting. Finally, if you don’t have an Apple Watch yet, do remember that iPhone has many fitness and health features built in as well, including the fitness and motion tracker and the pedometer features of Health app on iPhone, which work well on their own as well, even if you won’t get a little ‘stand up’ nudge, it’ll be up to you. I like the stand up reminder, some days I hit the goal, some days I’m just under it. There has been a few times where I’m actually walking around and I’ve gotten the reminder, that’s a little weird, but nothing is perfect. I like how Apple Watch acknowledges your progress (or lack thereof) at the end of the week and then asks to reset and readjust your activity goals too. I’m not able to be super active but I do think it helps. I enjoy being an early adopter for this device, usually I wait until later releases, but this is a fun one to be on board this early with. I can’t wait to see how it evolves over time, I think by the 3rd revision or so, it’s going to be really amazing, it’s already so complex and detailed, very refined. I’m a little confused by the interface sometimes still, and the settings on iPhone and apps from there going to the Watch are a little strange too, but there is a learning curve with all tech I guess. The reminders only show up if you are sitting for the first 50 minutes of an hour. If you move a bit every hour you will never see it. When you look at the stand time does it show that you are standing up every hour? I was awakened quite a few times LATE AT NIGHT (e.g at 03:00′ am) because of being prompted to stand up for a minute by my apple watch! During some of those times, the “Sleep++” app was running on my watch (actively recording my sleep). I wouln’t want to completely deactivate the stand reminders for daytime, but how can I be spared from late nocturnal annoyances, please? Is there a way to fine-tune the settings for doing so…?! same thing happened to me yesterday. I tried airplane mode and it dd not help. We have to be able to define blocks of time where it should be off (for example, from 10PM to 7AM). Ioannis, I feel your pain. This is THE most stupid software in the Apple Watch. It annoys me so much that I started writing my own. The other ridiculousness is the disregard for when you’ve just been walking. Whoever wrote or approve this app should be fired! The reminder to stand and the ring worked for a few days when I first started using the Applewatch. Now the reminder doesn’t work and the blue ring doesn’t move when I stand. The other 2 rings work just fine. So how do I fix this? The stand reminders simply don’t work. I git one reminder once, on the first day I wore the watch (3 months ago) and have never had another. I’ve tried deactivating the reminder, switching both devices on and off again, reactivating it etc etc. Nothing works. It’s really annoying. Also – sometimes it doesn’t record when I am up and walking about, or do get up and move to another room. 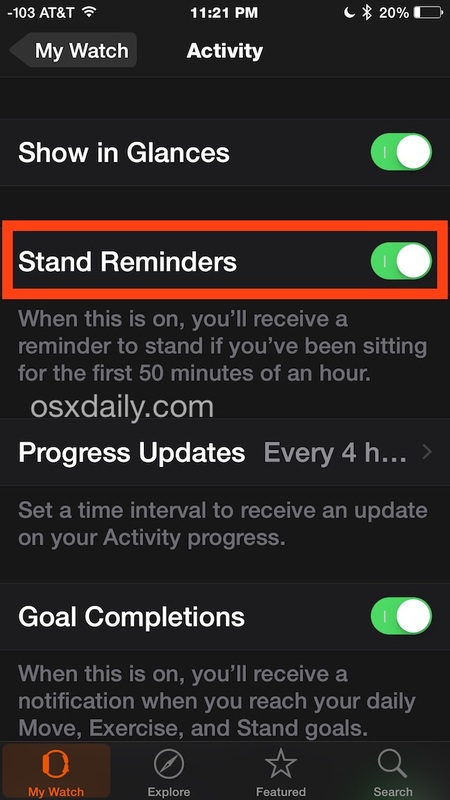 The stand reminder will not activate if the feature is disabled on Apple Watch, you need to turn it on. Then you can move around sufficiently to get the reminder to go away. Barely standing and barely moving will not trigger it, one has to actually get up and walk around for a few minutes to get the stand alert to go away. It’s good for active people, but for people who aren’t too active or who don’t move much it can be inaccurate in the experience that I have seen, and for them it’s usually an annoying nag to stand up or move when you either don’t want to, can’t, or can’t move around enough to meet the goal. It’s a work in progress, Apple Watch is. My stand reminders stopped when I downloaded the watch update and have not worked since. I then noticed the ‘mute reminders for one day’ kept coming on when I had not touched it. Just today I noticed it was set to green even though I keep turning it off. I did the reboot thing with both phone and watch. Not sure what else to do at this point. Is there such a thing one can get for an iPad? I love the stand reminders and they have been working fine and reminding me from 6am to 6pm to stand. All the sudden today, it is reminding me to stand in the middle of the night-every hour. I can’t find where to adjust the time for the reminders. Is this possible. Help? How do I mute activity reminders forever instead of just for a day? I get my move and exercise goals in the firts to hours of the day, i am very active and are walkinking most of the day, but may “stand” activity stay zero?? Please help me, what am I doing wrong? I like activity tracker functions including the reminder to stand EXCEPT when it tells me to stand just a few minutes after I’ve been walking around. My expectation is that it would have a timer that goes off about 50 minutes after the last time the wearer stood up. It is RIDICULOUS that it goes off 4 or 5 minutes after I’ve just been up and walking around. My stand reminders have stopped and also it doesn’t even move anymore both of the other trackers work fine for moving and exercise I have turned both devices off and back on and nothing has helped. Any suggestions would be appreciated. When the stand reminder babes, I hit the up arrow and immediately get up and move around for an hour. When it tells me that I have accomplished my minute, do I hit the dismiss button or the arrow up button? How can you adjust the breath and stand reminders so they don’t wake you up. Can they be adjusted from a certain time to start and a certain time to stop, the users choice? Not everyone has the same sleep pattern or needs. This watch keeps waking me up telling me to breath or stand during the night and that makes zero sense.